Easily Implement Your Energy Building Blueprint! Learn how to get your energy back so you can get back to doing more of the things you enjoy and need less naps. Identify the most common symptoms that may be preventing you feeling motivated and effective in your business. You're not alone! 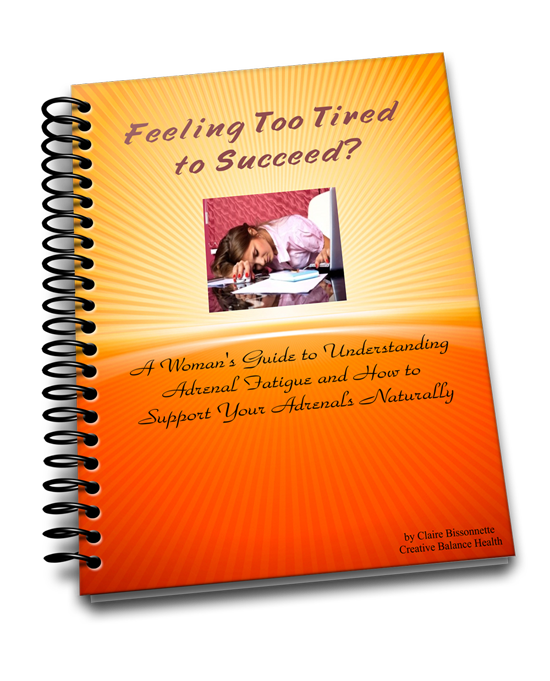 As a certified Functional Diagnostic Nutrition™ Practitioner and Integrative Nutrition Health Coach®, I created a supportive environment where I help other women like you who don’t know why they are so tired and lacking their usual focus to reclaim their energy and quality of life with the simple strategies revealed in A Woman's Guide to Understanding Fatigue and 10 Easy Ways to Increase Your Energy Report!. Submit your name in the form to the right and you'll receive this Special Report to help you quickly feel better. When was the last time you talked with someone about your exhaustion and received the personal attention you deserve? It’s rare for anyone to get an hour to work on their energy and nutrition concerns with a trained professional who really listens and takes you seriously. You know how some women are too tired, despite taking naps, to fully engage with their career, relationships and family and can’t find any answers or relief? Well what I do is help them to identify the root causes of their fatigue and learn simple self-care strategies to regain their vitality and enjoyment of life. I will guide you to find the food and lifestyle choices that best support you. I will also help you to make gradual, lifelong changes that enable you to reach and keep your current and future health goals. "I felt heard, validated, supported, less stressed, more peaceful, and happier with my choices..."